After years of using an inefficient thistle-seed feeder or none at all, I bought what looks to be a good one. In the past we used a feeder with four small ports through which the birds took seed. Each port had a perch. But only four. The new feeders (two) are metal mesh. The birds can grab the mesh to perch wherever. As many as six have used a feeder at one time. The seed also is more visible, at least to me. Filling is as simple as removing the cap. 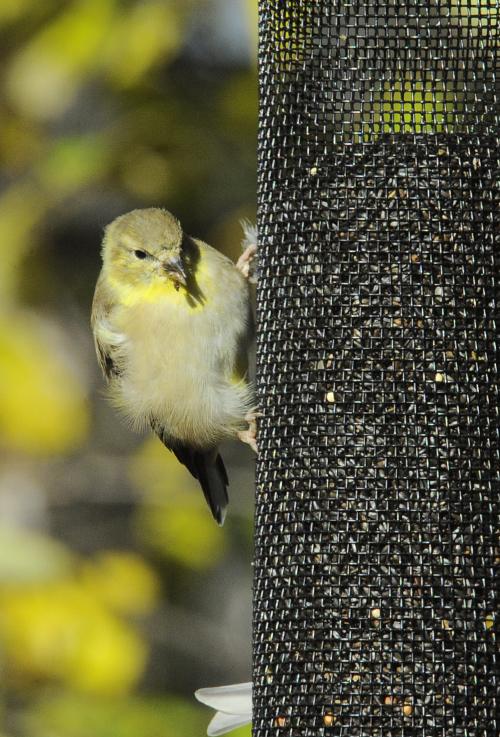 Goldfinchs have been eager feeders since Day One. Our Green Heron, by the way, was back in our swampy pond yesterday. That makes nine of 10 days. It does not come to the new feeders. Given today's colder, cloudy weather I won't be surprised if we don't see it today. It's been a late migrant for several days.